This winter I was hosting my twins’ first birthday party and I decided to keep things relatively simple with a ‘Build Your Own Burritos & Bowls Bar’. We baked some chicken with taco seasoning as well as adding in all the fixings like cilantro lime rice, beans, pico de gallo, guacamole and so much more. 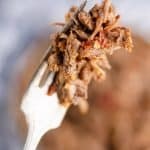 I wanted to have a second meat option, but didn’t want some boring shredded beef. 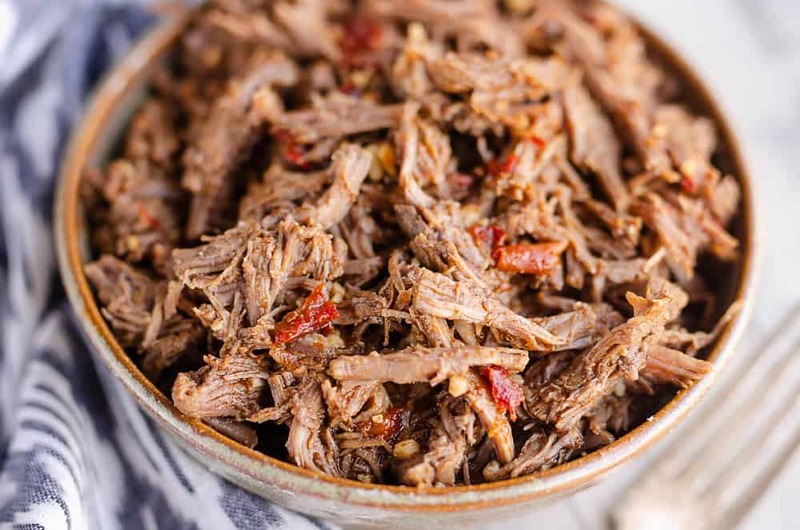 I spiced things up with this Chipotle Garlic Pressure Cooker Shredded Beef and made it quick and easy in the Instant Pot which was a win win! 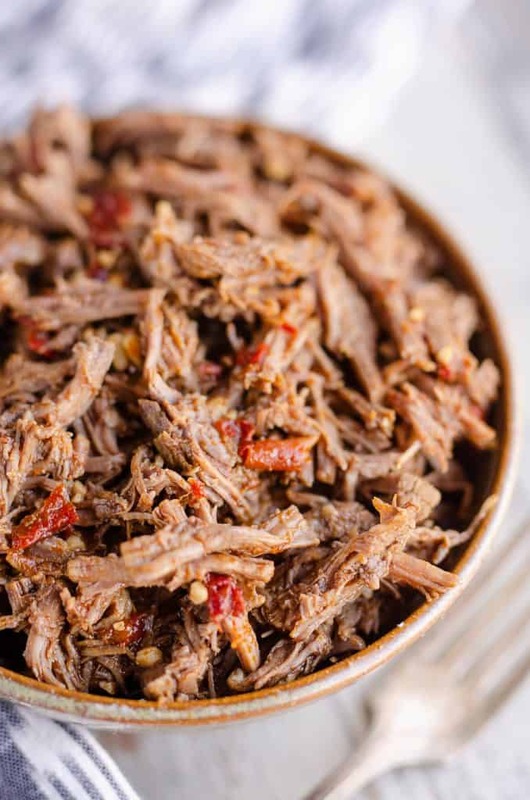 Not only is the Instant Pot great for easy weeknight dinners, it is such a great kitchen appliance when it comes to prepping for parties. You can open up room on your stove top and let your meat pressure cook while you are making all the other food. 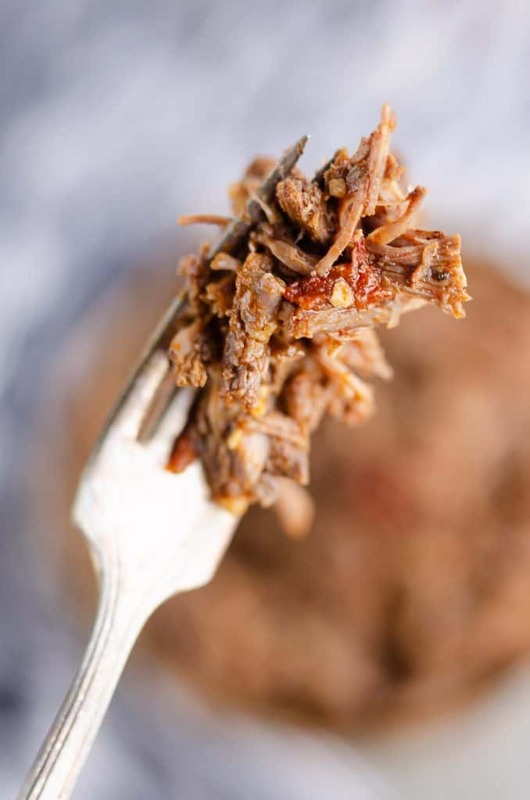 To make this Chipotle Garlic Pressure Cooker Shredded Beef, turn your Instant Pot to saute, add in some oil and sear the meat. Once you brown the meat a little, toss in a few ingredients and you can set it and forget it. Kind of like a Crock Pot, but without having to plan 8 hours in advance! I typically use chipotles in adobo sauce when making a recipes like this Chipotle Ranch Dip. Last time I was grocery shopping I accidentally bought a can of Chipotle Sauce in the Mexican section instead of chipotles in adobo. I decided to pop it open and give it a try. It has a slight sweetness to it and still packs a good punch of flavor. Instead of having to chop up the whole chipotles you can just toss the can in with your beef along with the other simple ingredients. Cook the beef for 25 minutes and then allow it to naturally release for 20. After the 20 minutes are up, turn the knob to vent to release any additional pressure. Open the lid and carefully remove the chunks of beef. Using two forks, shred the meat and return it to the pot. Add the lime juice and give it a quick stir. 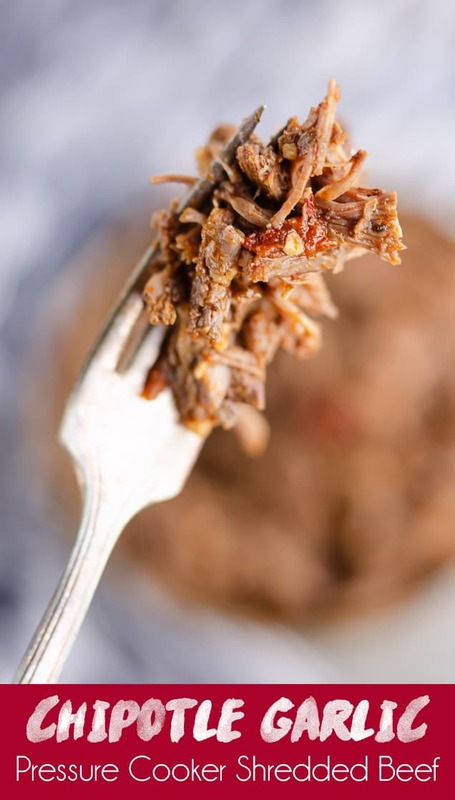 Serve Chipotle Garlic Pressure Cooker Shredded Beef on street tacos, burritos, bowls, or any recipe requiring shredded beef that needs to be kicked up a notch! Turn the electric pressure cooker (Instant Pot) on to saute function and add the oil to the pot. Cut the roast into 2-3 inch chunks. When the oil is hot, arrange the chunks of beef on the bottom of the pot. Sear for 3-4 minutes or until the meat is browned. Flip the meat over and repeat. Add the cumin and garlic to the pot and saute for a minute. Add the beef broth and scrape the bottom of the pot with your wooden spatula to remove any bits of browned on meat. Add the chipotle sauce and salt to the pot and place the lid on. Turn the knob to seal and cook on high pressure for 25 minutes. When the meat is done cooking, allow the pressure to naturally release for 20 minutes. After the 20 minutes have passed, turn the knob to vent and release any additional pressure. Carefully remove the pieces of beef from the pot onto a cutting board. 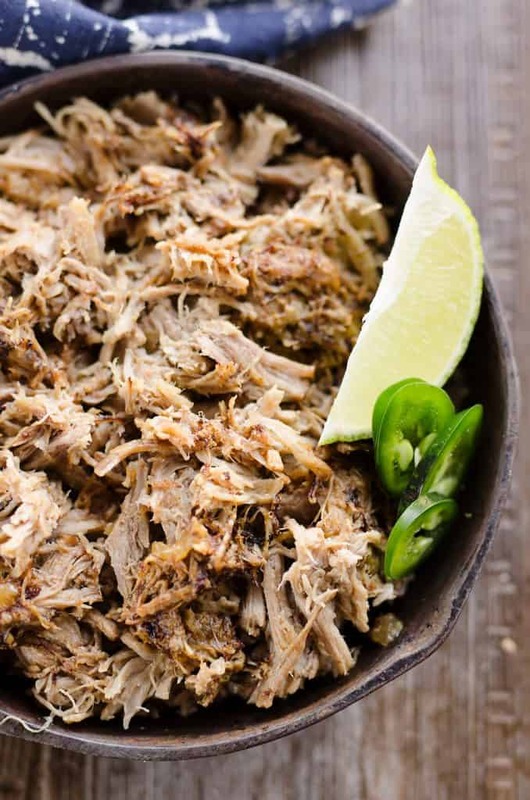 Using two forks, shred the meat and return it to the pot along with the lime juice. Stir and serve hot! 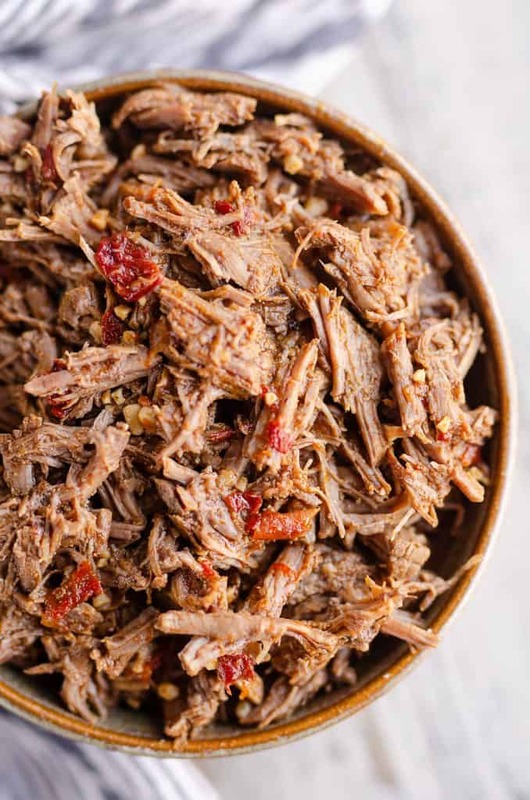 More Easy Pressure Cooker Recipes! I saw pics of that birthday it was NOT simple! But this recipe sure is. LOVE IT! The flavor in this was AMAZING and it made great leftovers too for lunch. This is genius! I do not use my Instant Pot enough, but I totally need to make this! Great flavor! And so many uses for this meat! Thank you!